Stewart R: Following the success of last year's major Marvel surprise, Guardians Of The Galaxy, the belief that the studio could dip into their character pool and put nearly anyone on the screen and rake in the dollars truly solidified. 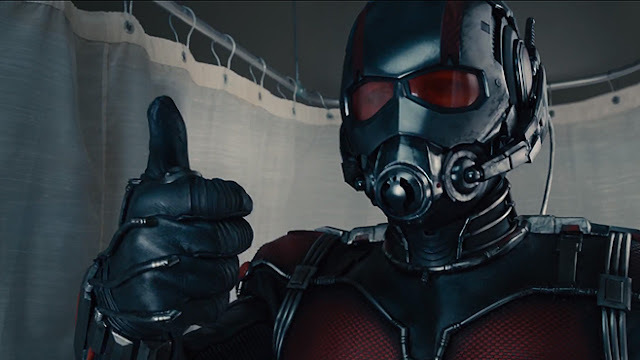 For half a dozen years starting in 2006, an Ant-Man film had been in development, scripts were written and rewritten, and then in 2012 Edgar Wright shot test footage which suggested the premise of a hero who could shrink to the size of an ant and back to normal size in an instant 'could' work. Yet the studio were still not fully convinced. 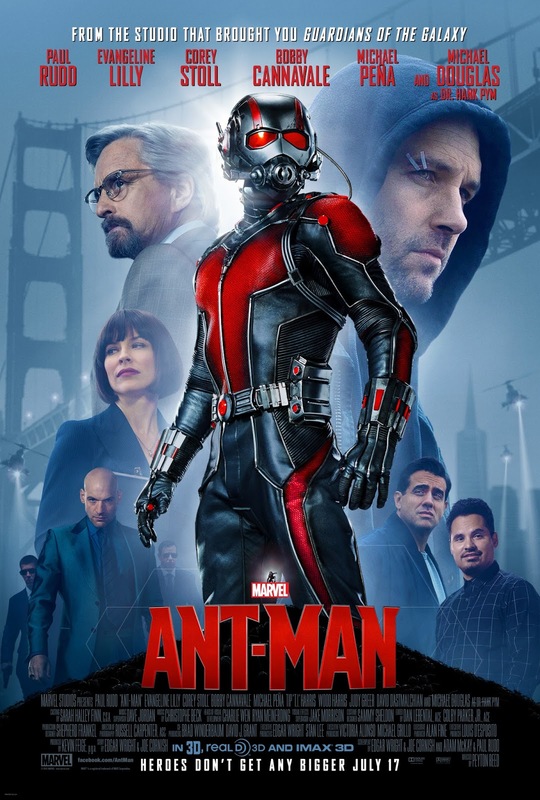 Here we now sit, three years later, Edgar Wright gone, replaced in the director's chair by Peyton Reed (Yes Man, Bring It On, The Break-Up) and the ever-young Paul Rudd donning the Ant-Man suit. So can the man who becomes the little guy be a big hit? From the get-go Ant-Man shows us that this is part of that larger Marvel Cinematic Universe with a neat flashback to the late-1980s where Hank Pym (Douglas) clashes with those familiar founding members of S.H.I.E.L.D. in regards to his greatest discovery - the Pym Particle - which could be a huge boon to mankind, yet poses the very gravest of threats in the wrong hands. 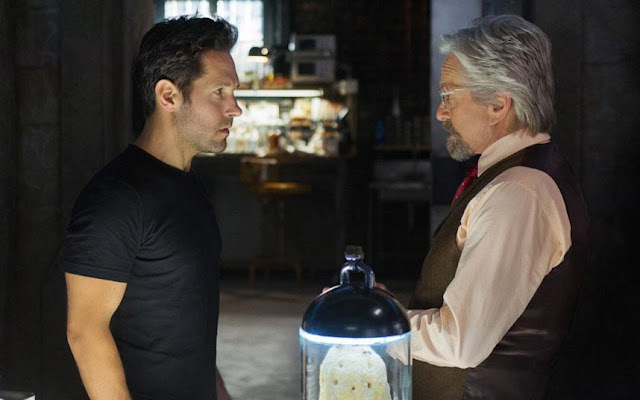 This whisks us then to the present day where Pym has lost nearly everything in the process of keeping his secret over the course of 30 years, only to see his efforts be circumvented by a power-blinded protege, while at the same time, newly released cat-burglar convict Scott Lang has lost his family through the course of his poor life choices and subsequent incarceration. The theme of redemption is pushed throughout the runtime as both men try to atone for past mistakes, yet this is not a dark film by any means. It's probably the lightest and possibly funniest (in a close run thing with GOTG) of the Marvel movies to date with a feel-good streak a mile wide. There's the smallest of nods to Pym's comic book 'domestic troubles' and Rudd's Lang is quick to point out his non-violent past concerning his crimes, setting these men as mildly flawed characters you can't help but empathise with. And flawed characters make for an entertaining ensemble when you're conducting a heist! The premise itself is quite simple: these outcasts are brought together and on a mission to prevent the driven and ethically unsound Darren Cross from replicating and selling Pym's work to the highest bidder. 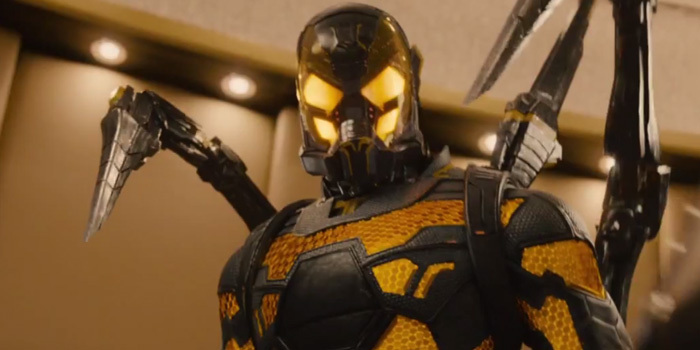 To do that they have to break into his hyper-secure lab and destroy all of the mysterious Yellowjacket tech. The story barely drifts away from this concept once Pym and Lang meet - save for a superb, in-Universe distraction piece which certainly entertains - and while the core group of Rudd, Douglas and Lilly hold it all together with good individual turns and a decent amount of chemistry, the film does suffer from a lack of true threat and a countdown of the villain's progression that's just too aware of the film's own runtime. Stoll is given practically nothing to work with outside of 'be that spurned guy who's taken things too far and doesn't feel bad about it' and by the climax he's little more than a masked hoodlum who goes for the personal revenge route too soon considering his evident genius. There are also a few issues surrounding the editing of some sequences and the behaviour of characters occasionally baffles (especially the police who are quite 'Keystone' in their instant decision making). Certainly one conversation scene in a car was so busy in the edit that it actually jarred me out of my immersion in the dialogue as a result. Thankfully, the sense of fun is strong enough to smooth over such plot and technical flaws for the most part and the jokes, gags and comedy turns really do help to push it all along. In a bizarre twist, some may look back on Ant-Man and pluck Michael Peña's Luis out as the true hit of the film such is his memorable turn as the gullible and over excitable ex-con. His recollections of heist-hookup Chinese whispers elicited chuckles each and every time and, in a way, I wish there had been chance for more. Rudd, known for his strong comedy background, gets some decent self-depreciating lines and in tandem with Douglas at his charming best, the put downs, zingers and light-bitching play out well. While Lilly's Hope van Dyne doesn't get to indulge in the comedics as much, her portrayal as a strong woman struggling with her bitterness and the cloud of cotton wool wrapped around her by her father hits the emotional note perfectly when her and Hank's relationship really comes under the microscope. Her performance certainly has me very hopeful of what her character's future may hold beyond the runtime of Ant-Man. From a visual perspective, the Ant-Man powers and training also feel fresh in the Marvel mould thanks to the great effects work that plays the miniaturisation card incredibly well (adding once more to the humour) and with a surprising amount of variety. To this point I've only seen the 2D print, but will be going back for a 3D viewing this week on the strength of dynamic sequences that seem to be tailor made for the stereoscopic format. Lang zaps back and forth between his bug and human sizes with a real-time kineticism that avoids the slo-mo mechanism we've witnessed in Age Of Ultron and Fox's Days of Future Past to portray their respective speedsters, while maintaining the sensation of a man's strength in microscopic form. The grand climax is a terrific reflection of this as the two foes slug it out across a grand and novel suburban battleground in their tiny forms. An additional nod goes the way of the de-aging process applied to the 71 year old Douglas in that opening scene which shows just how far the make-up and CGI process has come in that regard.